It appears that she died in 384 while Jerome and Marcella were studying Psalm 73. In a letter relaying her death to others within the city of Rome, Jerome writes to Marcella that Lea, a woman of austerity, obedience and remarkable penances had died. He described her as “blessed,” emphasizing the woman’s virtues as being worthy of heaven. Jerome provides no biography for Lea, for he assumes that Marcella knows Lea, and concentrates instead upon her virtues. Today, about the third hour, just as I was beginning to read with you the seventy-second psalm - the first, that is, of the third books - and to explain that its title belonged partly to the second book and partly to the third - the previous book, I mean, concluding with the words "the prayers of David the son of Jesse are ended," and the next commencing with the words "a psalm of Asaph" - and just as I had come on the passage in which the righteous man declares: "If I say, I will speak thus; behold I should offend against the generation of thy children," a verse which is differently rendered in our Latin version: - suddenly the news came that our most saintly friend Lea had departed from the body. As was only natural, you turned deadly pale; for there are few persons, if any, who do not burst into tears when the earthen vessel breaks. But if you wept it was not from doubt as to her future lot, but only because you had not rendered to her the last sad offices which are due to the dead. Finally, as we were still conversing together, a second message informed us that her remains had been already conveyed to Ostia. You may ask what is the use of repeating all this. I will reply in the apostle's words, "much every way." First, it shows that all must hail with joy the release of a soul which has trampled Satan under foot, and won for itself, at last, a crown of tranquillity. Secondly, it gives me an opportunity of briefly describing her life. Thirdly, it enables me to assure you that the consul-elect [Vettius Agorius Praetextatus], that detractor of his age, is now in Tartarus. Who can sufficiently eulogize our dear Lea's mode of living? So complete was her conversion to the Lord that, becoming the head of a monastery, she showed herself a true mother to the virgins in it, wore coarse sackcloth instead of soft raiment, passed sleepless nights in prayer, and instructed her companions even more by example than by precept. 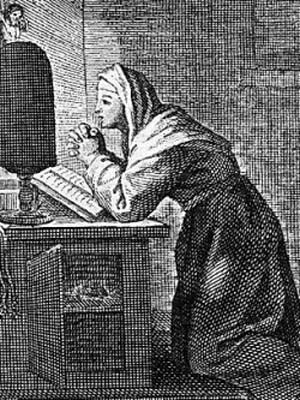 So great was her humility that she, who had once been the mistress of many, was accounted the servant of all; and certainly, the less she was reckoned an earthly mistress the more she became a servant of Christ. She was careless of her dress, neglected her hair, and ate only the coarsest food. Still, in all that she did, she avoided ostentation that she might not have her reward in this world. 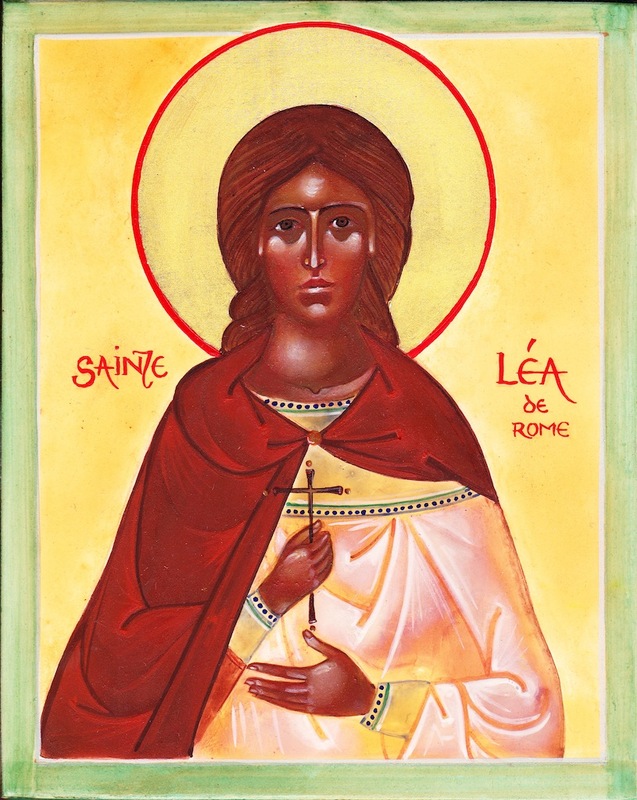 Now, therefore, in return for her short toil, Lea enjoys everlasting delight; she is welcomed into the choirs of the angels; she is comforted in Abraham's bosom. And, as once the beggar Lazarus saw the rich man, for all his purple, lying in torment, so does Lea see the consul, not now in his triumphal robe but clothed in mourning, and asking for a drop of water from her little finger. How great a change have we here! A few days ago the highest dignitaries of the city walked before him as he ascended the ramparts of the capitol like a general celebrating a triumph; the Roman people leapt up to welcome and applaud him, and at the news of his death the whole city was moved. Now he is desolate and naked, a prisoner in the foulest darkness, and not, as his unhappy wife falsely asserts, set in the royal abode of the milky way. On the other hand Lea, who was always shut up in her one closet, who seemed poor and of little worth, and whose life was accounted madness, now follows Christ and sings, "Like as we have heard, so have we seen in the city of our God." And now for the moral of all this, which, with tears and groans, I conjure you to remember. While we run the way of this world, we must not clothe ourselves with two coats, that is, with a twofold faith, or burden ourselves with leather shoes, that is, with dead works; we must not allow scrips filled with money to weigh us down, or lean upon the staff of worldly power. We must not seek to possess both Christ and the world. No; things eternal must take the place of things transitory; and since, physically speaking, we daily anticipate death, if we wish for immortality we must realize that we are but mortal.